In Wellington, New Zealand it’s summer in January. My brother Mike has just moved there and is going to be sending me plant pictures to share, as well as all kinds of stories about life in another part of the world. Gas costs $8.00 per gallon, aren’t we lucky? It appears that Wellington is in zone 9, just a bit warmer than my Seattle area zone 8. 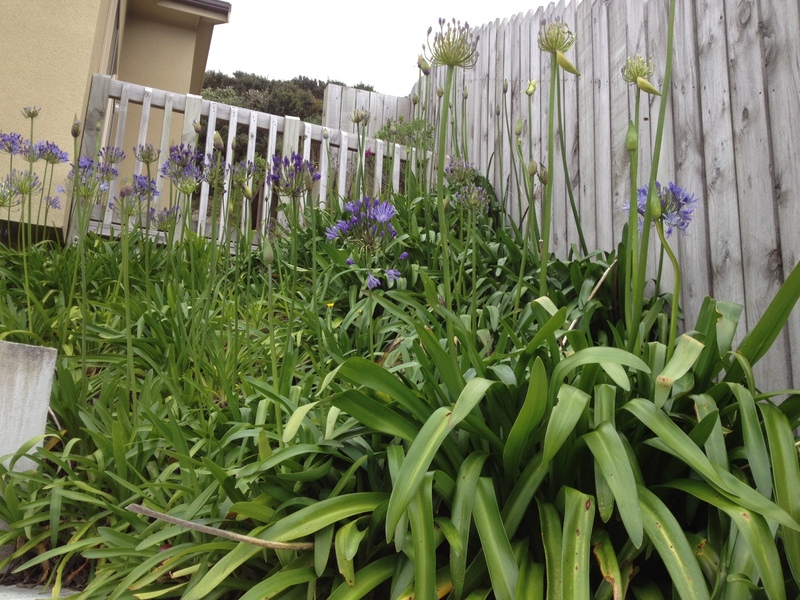 Mike’s first discovery is a huge clump of Agapanthus, or Lily of the Nile. It looks like it’s ready for some dividing, as it’s moving up the hill and into the house! I’m guessing that with less competition from itself, it would be happier and bloom more. It grows in zones 8-11 and blooms from mid-summer into the fall, with either white or blue flowers. It forms an evergreen clump and is native to South Africa. This plant is quite distinctive, once you learn it, it’s hard to miss. It’s really popular in central California, where I lived before the Northwest.